Nico Rosberg's sensational start to the new Formula One season shows no signs of slowing down after the Mercedes driver clinched the Chinese Grand Prix on Sunday. Mercedes' Nico Rosberg recorded a perfect start with the third straight win in 2016 Formula One season as he won the Chinese Grand Prix here on Sunday. After taking pole through Saturday's qualifying, the German finished first with one hour 38 minutes 53.891 seconds, about 38 seconds ahead of Ferrari's Sebastian Vettel. 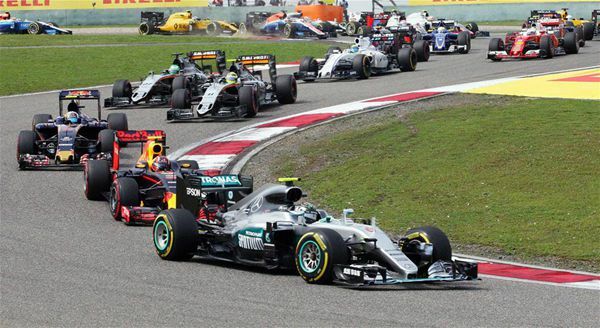 Now Rosberg's lead on world championship standings has been extended to 36 points. However, he shrugged off any talk about the world champion. "It's too early to make any premature conclusion," said Rosberg. Rosberg became the fourth driver to win six races in a row after taking away last three victories in the 2015 season, joining Vettel (nine), Alberto Ascari (seven) and Michael Schumacher (six). Red Bull's Daniil Kvyat and Daniel Ricciardo finished third and fourth respectively. Defending world champion Lewis Hamilton began from the back due to engine problems on his Mercedes racing car but managed to place seventh.